In the closing days of 1848, President Polk sent a message to Congress confirming the discovery of gold in California. This marked the beginning of the gold rush from the east coast. 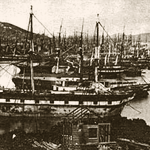 By June of 1849 there were already about 200 ships floating deserted in the harbor, abandoned by gold-seeking crews. 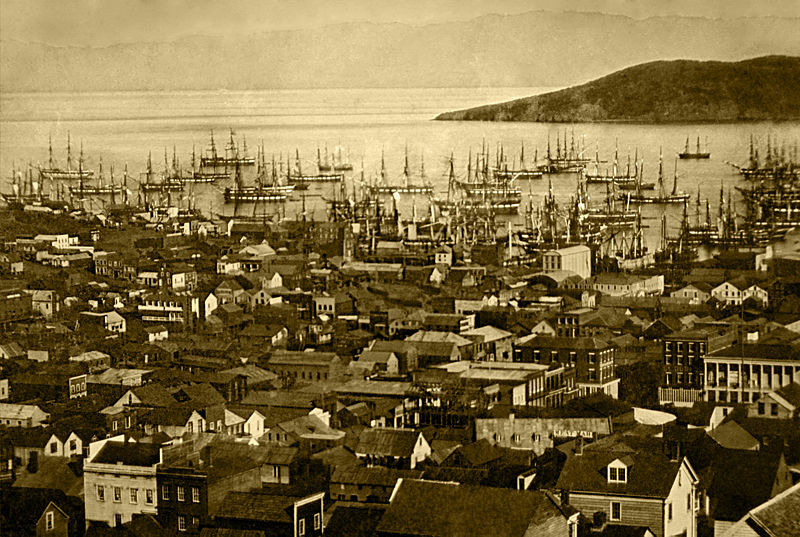 On this date — November 10, 1849 — the Collector of the Port of San Francisco filed an official report stating that since April 1st, 697 ships had already arrived. For the record, 401 of these were American vessels and the remaining 296 had sailed in from foreign shores. This brings to mind the famous daguerreotypes of Yerba Buena Harbor looking like a burned-out forest of ship masts, but searching for that little item led me serendipitously to another. This next piece is a far more interesting story, and one that took place just seven years later. It was the era of the tall-masted clipper ship, an era of speed, adventure and danger, with every trip around the Horn a race against time, other ships, and the odds. 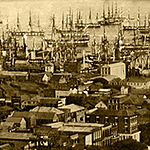 In late June of 1856, three clippers cleared New York Harbour and set off for the race to San Francisco Bay. One of these — Neptune’s Car — was captained by Joshua Patten. This was to be Captain Patten’s second voyage on this vessel, the first having been a memorable one. It had been his maiden command, and he’d made the 15,000-mile trip from New York Harbour round the Horn to the Golden Gate in a mere 100 days, 23 1/2 hours — a time as good or better than the fastest clippers on the water. 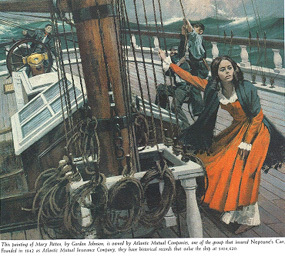 Even more interesting, the promising young sailor had refused to accept the command until the shipping company allowed him to sail with his new wife, Mary. Though no one yet knew it, this was to be Mary’s story. "I discovered your website in Frommers Budget Travel which prompted me to buy an iPod last December and then download all of your podcasts. Your episodes are diverse and unbiased. I like that. Opera to Motorcycles. Job well done!"